Star Trek makes several scientific assertions that go beyond current understandings of biology, chemistry, and physics. Names of hypothetical chemical elements need not concern. But other assertions run from the controversial to the flat-out erroneous. 3.2.3 Who eats real food? Again, Star Trek assumes biological evolution. The series finale of The Next Generation explicitly endorses abiogenesis. Captain Picard’s arch-jokester, Q, thrusts his hand into a gooey puddle he identifies as “primordial soup.” An episode of Voyager explores forward projection of evolution. It tells the tale of sentient reptiles who evolved from terrestrial dinosaurs. Ironically, these intelligent saurians refuse to accept evolution themselves. The producers couldn’t seem to decide whether to endorse convergent evolution or another kind of directed panspermia. At least one episode of the original series described an advanced race, the Preservers, who transplanted colonies of threatened humans to distant worlds. These colonies demonstrably included American Indians but might have included ancient Spartans, too. The social implications of evolution have already borne mention. The scientific implications bear concern here. Can life truly arise in so many places at once? If so, why haven’t the Vulcans contacted us already? Maybe they have. In one episode of Enterprise, a Vulcan survey craft crashes, killing its “skipper.” The survivors must then sustain and resupply themselves without betraying their otherworldly origin. For that matter, the Ferengi might have contacted us, and the Air Force covered it up! In real life, the United States government have listened for extraterrestrial radio signals for years. And found none. Star Trek assumes humanity will meet several races – Vulcans, for one – having limited, but effective paranormal gifts. Mr. Spock introduces the “mind meld” early., as a plot device. After that, Spock must use this technique often when circumstances seem to call for it. Likewise, “Betazoids” are true telepaths, and hybrid children are at least empathic. The Organians play an obvious role in keeping galactic peace. No one has yet proved paranormal gifts. Nor has anyone explained why Vulcans and Betazoids should have them, while other races lack them. (For that matter, the Romulans seem to have lost their gifts after leaving Vulcan—for whatever reason.) One can likely put this down to lazy writing. Such gifts find an obvious—and convenient—role in intelligence. One wonders why no one drafted any telepaths as court officers! Medicine follows from biology, of course. Here, Star Trek stays on solid ground in projecting advances in diagnosis and the management of acute trauma. In fact, within less than a month of the show’s premiere, three separate research organizations contacted Desilu Productions and Gene Roddenberry’s crew. All demanded to know who leaked sensitive information on current development projects. Star Trek makes many blithe assumptions about universal vegetable edibility. But it faces squarely the problem of cross-world infection. Would any species’ immune system necessarily protect against a germ that “evolved” on a different world? Many of the most riveting episodes involve various infectious ailments. After that, a Klingon scientist tries to “augment” his own people. And ends up disfiguring every member of his race. Somehow they lay the blame on human society; hence the long Federation-Klingon Cold War. In reaction to these horrors, the Federation and all its societies pass a universal law: no individual may enhance himself or his children genetically for any reason. An ethic arises that compares such enhancement to cheating at athletic competition. But the treatment of this concept turns into an attitude of banishment of all who could out-qualify their fellows. In fact, no one can prove that genetic enhancement would have such highly tailorable effects. Worse, genetic enhancement of modern foodstuffs has already created identifiable problems. For instance, genetically modified corn and soy threaten the honeybee Apis mellifera with extinction. So how can anyone predict anyone could “augment” himself or his children, let alone the entire human race? Or the Klingon race? This leads to another consideration: those food replicators. Does anyone in the Star Trek world eat real food anymore? The ubiquitous replicator descends spiritually from the microwave oven of today. Not one person has considered the long-term effects of “re-sequencing” proteins and making instant foodstuffs from that process. Surely this would produce dozens of vitamin and other nutrient deficiencies. And that covers only the basic idea of eating such food. In fact, characters routinely order the most decadent, and frankly slowly poisonous, foods and drinks imaginable. Did anyone consider these shortcomings of the Western diet of our own century? Cancer and sarcoma run rampant in Western society. The same heavy loads of sugar and corn syrup that induce diabetes mellitus, also promote malignant tumor growth. Malignant cells thrive on sugar. All those characters replicating cheesecakes and ice cream should think of that. They don’t. So why doesn’t Dr. McCoy think of that? Or Dr. Crusher, or Dr. Bashir, or the Emergency Medical Hologram aboard Voyager? Alcoholic drinks present their own special hazards. Then again, the Federation buys the secret of “synthohol” from the Ferengi Alliance. But did they really get a good bargain? To be sure, at least the replicator would not replicate all the bad things that go into modern food. “Round-Up” (glyphosphate/Monsanto) and other herbicides and pesticides spring to mind. (For that matter, the communist society likely de-chartered Monsanto and imprisoned its last executives.) But surely no replicator could possibly reproduce all the micro-nutrients in food. A society that accepts evolution would surely set great store by foodstuffs that stood the test of deep time. Would they not? Exceptions do come up. The Enterprise show does not count—Captain Archer was the last captain to ship out with a cook. But of course Captain Janeway must have a cook. She finds herself unable to re-fuel easily. So she tells her crew: eat real food, or the ship runs out of fuel. It’s that simple. (The enterprising native cook, finding no regular galley on board, builds one!) Beyond that, Captain Sisko enjoys cooking real food. He knows replicators can’t give creole food its subtle flavors. But everyone regards that as recreation, or adaptation to hardship. No one considers that a lifestyle to recommend to everyone. Perhaps if more people did cook real food, they’d come down with fewer diseases, and would live longer. But: how much land can they spare for farms, pastures, and so forth? “We’ll show you how to feed a thousand people,” boasts Captain Kirk to one native race, “where you fed one before!” Yes, but how well? But Star Trek did not approach the problem consistently. One original-series story centered on an effort to supply a human colony with a super-hybrid grain. Why would that even present a problem? Star Trek assumes the truth of every canard liberals make about the effect of heavy industry on the environment. A time-traveling character asks explicitly, “Do these people know their fossil fuels are nearing depletion?” Global warming? Check. Internal combustion? The Academicians, whoever they are, forbid this. The canon says little about how people get around on a planet in that future era. (Getting around in space presents only one possible environmental problem. The chief problems of space travel have to do with trespass or passing through someone else’s war zone.) And it says nothing whatever about how human beings moved away from the fossil fuel economy the producers obviously hate. Nor do they describe the sources of energy or how United Earth society acquires that energy. Do they rely on new technology they also “scored” from other Federal member societies in exchange for stopping their various wars? No one says. Star Trek takes great dramatic license with theoretical physics. Flying faster than light presents the obvious problem. Albert Einstein regarded that as flatly impossible. True enough, the Special and General Theories of Relativity might not accurately explain the universe. They might even conflict with one another. But why do the writers of Star Trek accept some parts of Einsteinian physics, but not others? Worse yet, the original show had not played for half a season before it jumped into time travel. It began with a story of a starship appearing as a UFO, and the Air Force scrambling to intercept her. Then it explored the other side of time travel: parallel universes. Evolutionists love that concept. To them the concept can guarantee that a universe will arise in which life will spring up on any world having liquid water on it. When you can try a game an infinite number of times, you will certainly win at least once. Right? That creates problems enough. Add to it: Star Trek can’t make up its mind whether “changing the past” merely creates a new universe, or changes ours. It has handled the concept with no attempt to enforce consistency. To be fair, Manuel Coto, in the Enterprise show, came close. But the producers of the last three films have destroyed the concept completely. Last of all, the Transporter presents the worst problem. How can one “transport” any object without setting off a nuclear explosion? What possible or even imaginable information system could remember all the myriad placements of trillions of cells—and septillions of molecules—that make up a human being? And does a person making a trip by transporter still carry his immortal soul, or not? Is that person even the same person? Novelist James Blish admitted: No, he isn’t. The only reason for the Transporter system was financial. Without it, the crew would land a space-borne rocket whaleboat on a planet every week, and take off again. That kind of special effect costs money. Gene Roddenberry could not or would not afford it. In this and other examples, drama informed the science. And as long as the franchise continues, it still does. Star Trek created characters anyone could believe. It also inspired several inventions we use today. The developer of the first flip-style mobile phones wanted to imitate the “communicator.” The armed services have already developed directed-energy weapons. (Hand weapons remain a dream, but main ship weapons show promise.) The holographic research laboratories of The Next Generation inspired “virtual reality.” The extra-versatile touch screens in the same series inspired modern “smart phones” with flat, programmable screens. And one engineer wants to build a full-scale Enterprise. He hopes to encourage more people to pursue scientific, technical, engineering, and mathematics (STEM) careers. But the teams also created a setting only a liberal idealist could believe. Even then it ignores certain facts of physics and even biology and medicine, and distorts others. By all accounts, they will make those problems worse, not better. ↑ The Star Fleet Technical Manual features a Periodic Table of the Elements having many elements that since have gained other names. It names other elements that simply should not be present where the table places them. Whoever composed that table, has no idea of how an element finds its place in it. But one may assume that future generations of chemists changed names of elements we know. They would want to make them less “Earth-centric.” For instance: “celebium,” from the “Turnabout Intruder” episode, is probably plutonium with a new name. The chemical-toxic properties Dr. McCoy attributes to it, fit plutonium. The new name likely would connote its relatively short half-life. ↑ See “Balance of Terror” and “The Enterprise Incident” in the original series, and “Kir’Shara” on Enterprise, among others. ↑ Specifically, a Ferengi bartender, his brother, and his nephew become the “Little Green Men” (Deep Space Nine) who crash-landed at Roswell, New Mexico, in 1947. ↑ “Errand of Mercy,” “The Trouble with Tribbles,” etc., in the original series. In The Next Generation the Organians need restrain the Klingons no longer. Thank Ambassador Curzon Dax for that. ↑ See “Affliction” and “Divergence” in Enterprise. These stories explain why, in the original series, Klingons lack the pronounced forehead ridges they sport in other projects. ↑ Representative Alan Grayson, D-Fla., bitterly accused his Republican colleagues of having no better health plan than "Don't get sick!" He would do well to review the research of alternative practitioners that suggests one can avoid getting sick. ↑ See, for instance, “The Thirty-sevens” in Voyager. The namesake ship brings aboard a 1936 Ford truck. The ship’s helmsman, an aficionado of United Nations prehistory, starts this truck. His fellow officers express amazement at the profligacy of the “propulsion system.” Indeed the master-at-arms threatens to clap him in the brig for stinking up the hangar deck. ↑ Alcubierre M, “The warp drive: hyper-fast travel within general relativity,” Classical and Quantum Gravity, 11(5), 1994. doi: 10.1088/0264-9381/11/5/001. 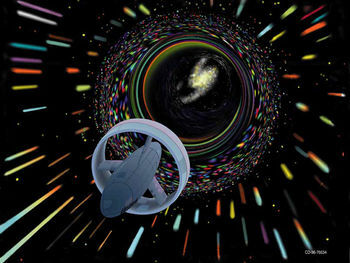 ↑ White H. “Warp Field Mechanics 101.” NASA. ↑ See “Mirror, Mirror” in the original series, “Crossover” and its sequels in Deep Space Nine, and “In a Mirror, Darkly” in Enterprise. “The Alternative Factor” does not count. Even fans will not accept its thoroughly flawed science. ↑ Blish, James. Spock Must Die! New York: Bantam Books, 1970. ↑ See the site Build the Enterprise. The creator hopes to stimulate STEM applicants in two ways. First, the research for building such a ship would alone inspire thousands. Second, such a ship could fly deep-space missions of which NASA, ESA, JAXA, and RKK Energia can scarcely dream. It would also extend aeronautical and astronautical work life to new crafts and professions. Imagine space-borne divisions of construction craft unions, like the Ironworkers, for instance. This page was last modified on 27 March 2017, at 15:17.